You are interested in NLP? Then take a look through my site. Here you can find many interesting seminars or workshops and downloads regarding the topic NLP and Personality. Are you looking for practical, easy and playful methods and solutions for your professional and personal goals and issues? Moreover, would you like a range of creative methods for the development of your personality and emotional competence? Would you like individual support in small groups, a place where they take your feelings and wishes into consideration and a useful training that can help you take bigger steps in your life? So the NLP&Personalty Development Studio is the right place for you! We teach NLP in small groups (8-16 participants) and offer an open and warm atmosphere. The group stays together during the whole training time, experiencing a deeper mutual support and stability. An NLP-Training gives you a KEY to take your life independently into your own hands! In case you have uncertainties, inhibitions or doubts about working out a new life plan, don’t worry, already during your training new doors will open and you will have a better understanding of how to live a free and self-determined life. Every weekend you will learn new methods helping you to get in charge of your own life step by step. In order to find and solve your emotional entanglements and blockades, you will have to reach the level of the unconscious and crack the „code“. Everything happens careful and prudently. Participating in a NLP-Training is going to help you to get on with your private and professional development. You will step into an intensive cognitive and changing process. The goal? More contentedness and success in your life! What happens during the NLP-Training in the studio for NLP&Personality Development? Maybe you have already researched on the internet the different NLP offers and now ask yourself what would be the best choice for you. There are large and small institutes with different group sizes and target audiences. Some take place in holiday destinations or just around the corner and there is a diverse range of focuses. Some coaches just convey the NLP Formats, others offer additionally coaching techniques or extensive offers as in sport, business or therapy. This is bound up with the fact that nowadays NLP can be found all over the world. Therefore there are different interpretations and there are also several associations with different quality demands and ideas. 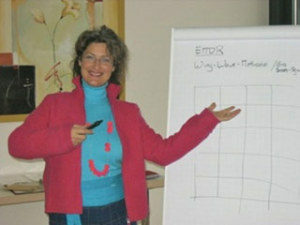 In my institute I teach according to the standards of the biggest German association for NLP (DVNLP). I appreciate the reliable, democratic association structures, teaching committee and the large number of publications! There is transparency because everything is accessible for the public. I like the possibility to co-determine and the tolerant diversity among colleagues. If you like to share this experience, visit our congresses. A NLP-Training is like a key store, a place where many closure and opening models are waiting for you. There is a lot to learn about the usage of keys so that none will break or get stuck in the lock; it is comparable to this situations in life where you are stuck in a dead end or you have a lack of orientation. How and what do you learn during your NLP-Training? With diversity: You will learn the whole range of the fascinating NLP methods and changing techniques. With creativity: We support you to reach your goal with holistic, musical and suggestopedic learning concepts. With clarity: You will learn to have a better understanding of yourself and others, furthermore how to communicate easier and more confident. With joy: Learning can be fun – our policy is laughing, experimenting and designing. Target audience: Who? For whom? A training takes more than 9 months. This means that you can take some time for yourself and absorb and integrate the new skills into your daily life. The motto: learn slowly, instead of fast. Obtaining a certificate requires a practical and written exam, so that you have to study seriously and this helps you to feel better about yourself and to develop more self-confidence. The training team is going to support and instruct you how to successfully coach others. You will feel successful! At the end of a NLP training all participants feel like they have learned something valuable in- and outside the group. They feel better, stronger and more freed. Participants say: „During Jenisons Practitioner-Training I could stay completely focused even on long seminar day due to the variety of methods and the participant focused layout of the teaching material. If you are looking for a place to relax and just lay back, than you came to the wrong place, because Jenison organizes an active program requiring your participation and experiencing. I especially liked the creative special „something“ as for example dance/ drums or color and style advice. The time during the training was a constant inspiration and even afterwards it helped me to grow and develop. All in all it was definitely worth the visit – thank you Jenison“, Birgit de Gruyter, Cologne. „It is a challenge in my professional position as a group leader of 10 people to concentrate on each person and to create a functional group. I firmly believe that through the training course I am up for the task and its practical exercises. Personally, I learned to show interest towards my family members and to help them with their daily problems by finding solutions together. Especially the contact to my kids got better, and they are even proud of me, which gives me a good feeling!“, Jürgen Wilms, Solingen. What is a normal day during the NLP-training in the studio?